Simon Sebag Montefiore's excellent book “Jerusalem: the Biography” is a masterly history of a city that is both “a den of superstition, charlatanism and bigotry” but also the point on earth where heaven and earth meet. Simon Sebag Montefiore (born 1965) is a British journalist and historian specializing in Russian History. His book Catherine the Great and Potemkin was shortlisted for the Samuel Johnson, Duff Cooper, and Marsh Biography Prizes. Young Stalin won the Bruno Kreisky Prize for Political Literature, the Costa Biography Prize, the LA Times Book Prize in Biography and Le Grand Prix de la Biographie Politique. Stalin: The Court of the Red Tsar won the History Book of the Year Prize at the British Book Awards. There can be no task more daunting (nor a quicker way to make enemies) that to undertake a history of the city of Jerusalem, but Simon Sebag Montefiore has risen admirably to the challenge producing an objective, well informed and entertaining biography of the city. It will not particularly please Zionists, Palestinians or secularists but will put a spring in the step of disinterested scholars everywhere. It is a wonderfully accessible work combining the earthly and the celestial, taking us through 3,000 years of history from the early Canaanites in their small and rather insignificant hilltop village, through to the creation of the state of Israel. He traces the history of the city from early Biblical Judaism with King David, the Maccabees and Jesus, then moving on to the Roman occupation when Christianity was imposed by Emperor Constantine leading to Jerusalem’s Holy Sepulchre becoming a place of pilgrimage. In the seventh century came Islam which also (like the Jewish and Christian faiths) foresaw the Day of Judgement as taking place in Jerusalem. Montefiore takes us through the Crusades with some fascinating insights from the Islamic perspective, including the writings of a contemporary chronicler Usamah bin Mundiqh who was on the whole very “fair and balanced” but who could not resist describing the infidel Crusaders as “mere beasts, possessing no other virtues but courage and fighting”. We are taken through the Mamluk and Ottoman occupations followed by the more modern history of the British, German, American evangelical and Russian interest and interference (sometimes bordering upon obsession) in the city. The history of the city is by no means restricted to and defined by the antipathy between Jew and Arab. Montefiore recounts the story of Good Friday in 1846 when the Catholic and Orthodox Easters fell on the same day with the resulting massacre that stemmed from the dispute over who had the right to pray first. The monks from both faiths smuggled in pistols and daggers and when the fighting started even crucifixes and ecclesiastical paraphernalia was put to good use to break some monkish heads. The Ottoman authorities tried to intervene but to no great effect. At the end of the fight 40 people were dead. The celestial had indeed become worldly. The book has room for a whole host of characters from Solomon, Saladin, Suleiman the Magnificent, Cleopatra and Churchill as well as Abraham, Jesus and Muhammad, not forgetting those who changed the course of the history of the city from the margins: the Kaiser, Disraeli (who saw the Jews and Arabs as practically the same, Arabs being “Jews on horseback”) and Lawrence of Arabia. Montefiore treads an even path through the more delicate modern history of the city, describing the Arab revolt and the consequences of the Balfour Declaration often using unusual sources such as the diaries of the aesthete socialite and oud player Wasif Jawharriyyeh “who “knew everyone and saw everything” as well as comments by authors such as Herman Melville who described Jerusalem as a “charnelhouse surrounded by walls, the old religions rotting in the sun”, and Flaubert who was on a “cultural and sexual tour” but was quick to see that the city was a den of vicious infighting between sects: “The Armenians curse the Greeks who detest the Latins who execrate the Copts”. Thackeray was equally sanguine: he describes most of the Jews as living in the “stinking ruins of the Jewish Quarter, venerable in filth”. Mark Twain, on his world travels written up in his “Innocents Abroad” which lampoons his sanctimonious fellow Americans, stopped in Jerusalem and was less than charitable, describing the city as a “pauper village – mournful, dreary and lifeless” and he was most unimpressed by the Church’s “trumpery, geegaws and tawdry ornamentation. It is clearly a difficult history to write as sources are many and varied and many histories have been written and rewritten by Zionists and Arabs alike – to their own ends. 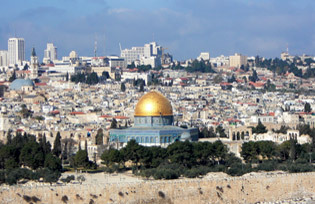 Even the archaeology of Jerusalem is a casus belli, one German archaeologist going so far as to describe it as the “peaceful crusade” an idea more than authenticated by Ariel Sharon’s “swaggering on to the Temple Mount guarded by phalanxes of Israeli police with a ‘message of peace’ in 2000 that clearly menaced Islam’s beloved Aqsa and Dome”. Montefiore makes it clear that there is very little of the holy and devout about much of the city’s history – there are endless tales of massacres and enslavement in the holiest and most contested city in the world. Montefiore takes us very ably through the changes that history has wrought on this city, which despite occasionally being marginalized by history – sometimes for centuries at a time – has always maintained its aura of a celestial city, the Zion yearned for by the Prophets of the Old Testament. This celestial city, is still, despite everything, where heaven and earth meet.